The sadness you feel when a loved one dies can be hard to carry around. Although they are no longer with you, you don’t stop loving them. One way to have a constant reminder of your loved one is with a beautiful piece of Ashes to Glass jewellery. We are pleased to have teamed up with award-winning British design company Ashes into Glass to offer a unique keepsake with which to honour your memories. 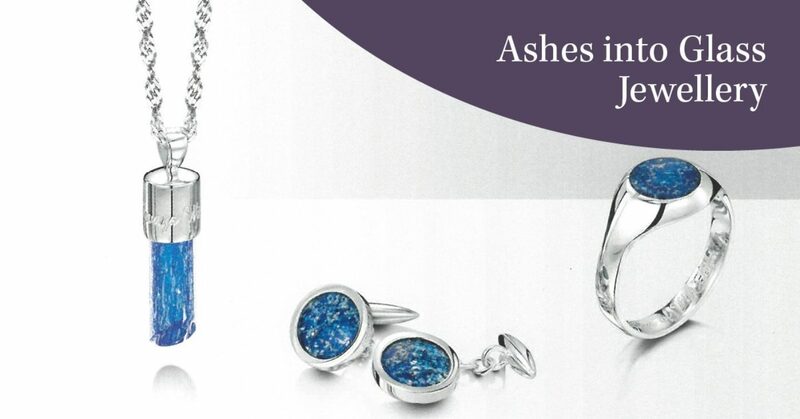 Using over 30 years’ experience as master jewellers, Ashes into Glass will layer your loved one’s ashes together with coloured glass crystals and clear molten glass to create a unique, everlasting and wearable way of always having your loved one close. Choose from a pendant, ring, earrings or a charm bead for a bracelet, or cufflinks, or a beautiful glass paperweight. Jewellery can be set in silver or gold and engraved as you choose, and there is an attractive choice of colours. Just one spoonful of ashes is used; you could to have keepsake pieces made for each member of the family. You might like to share the ‘Ashes to Glass’ story of your beautiful jewellery with friends who admire it or keep the secret close to your heart – no-one needs to know.